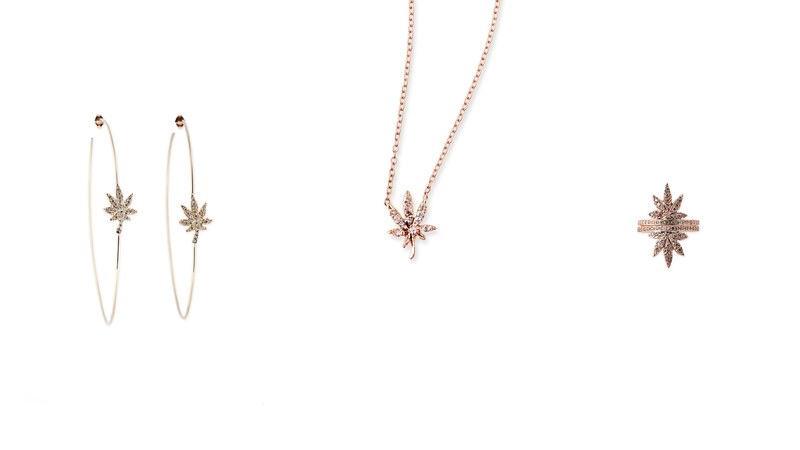 Los Angeles based fine jewelry designer Jacquie Aiche started integrating cannabis motifs into her pieces way before it was cool. In fact, her first ‘Sweet Leaf’ piece (the official name of her weed-inspired collection of pave diamond necklaces, hoops, and stack rings) was created a full decade ago as she was launching her own business. Aiche, who lives in Beverly Hills and grew up nearby, got her start by working at her family’s boutique, Damani, on Sunset Boulevard. After deciding to focus on her own line full-time, she closed up shop and shifted gears to jewelry. But not just any jewelry—jewelry that felt reflective of her own personality and lifestyle: whimsical, relaxed, unabashedly cool.